Not only are quartz watches the most accurate, but they’re also really stylish. While these watches still have gears, they rely on the Quartz crystal to regulate time instead of gravity. With an array of brands and styles to choose from, Quartz watches are affordable and easy to upkeep. So if you’re hoping to find a luxurious watch with an inexpensive price point, don’t completely disregard the Quartz watch before understanding how highly practical it is. 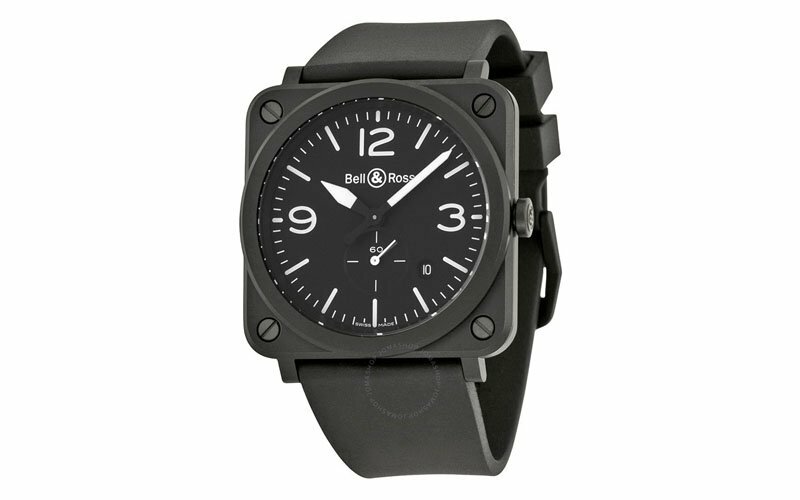 For the man who likes a little bit of luxury, the Bell and Ross Aviation Men’s Quartz Watch is made for you. Featuring a matte black ceramic case and bezel with a rubber strap and black dial, it’s all black style makes the white hands and index hour markers pop. The easily readable timepiece uses Arabic numerals to mark 3, 9 and 12 o’clock with a seconds sub-dial added at 6 o’clock. 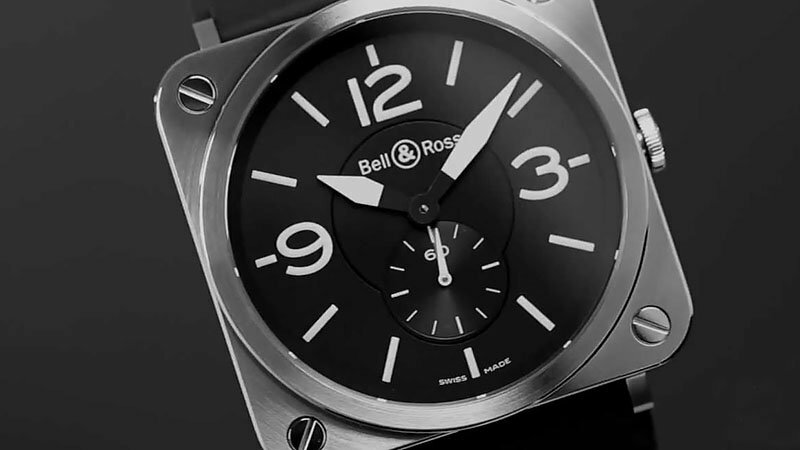 With a stylish square case, this Bell and Ross masterpiece has a diameter of 39mm and looks solid with the screws in all four corners. Breitling brings you a luxury watch that is eye-catching, with its leather blue strap and titanium case. The timepiece features a blue dial with silver hands and Arabic numerals which are bigger than the other numbers for 3, 6, 9 and 12 o’clock. It also has a digital chronograph which can time one-one-hundredth of a second for up to 100 days. Made exclusively for a man who prides himself on his state-of-the-art watch collection, this Swiss timepiece uses the latest electronic developments, featuring a chronometer-certified SuperQuartz calibre. For a highly sophisticated look, the Classima is a great dress watch, featuring classic Roman numerals that sit at 3, 6, 9, and 12 o’clock. This Swiss-made, stainless steel watch, with a white dial and luminescent markers, has a 40mm case which is 5.95mm thick. Think formal when pairing this watch with an outfit, while keeping in mind it’s minimalist sentiment. 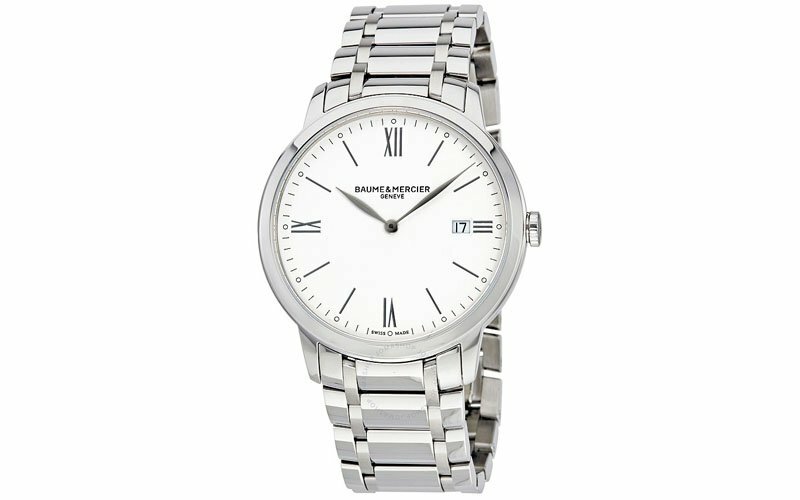 Longines created this performance sports watch with elegance and technical innovation in mind. The stainless steel dial features minute markers around the outer rim, as well as a chronograph with three sub-dials, including 60 second, 30 minute and 12-hour displays. Creatively, Longines uses its own quartz movement, calibre L440. With its black rubber strap and capability to reach up to 300 metres underwater, this multi-functional design is perfect for all sports, both on land and in the sea. 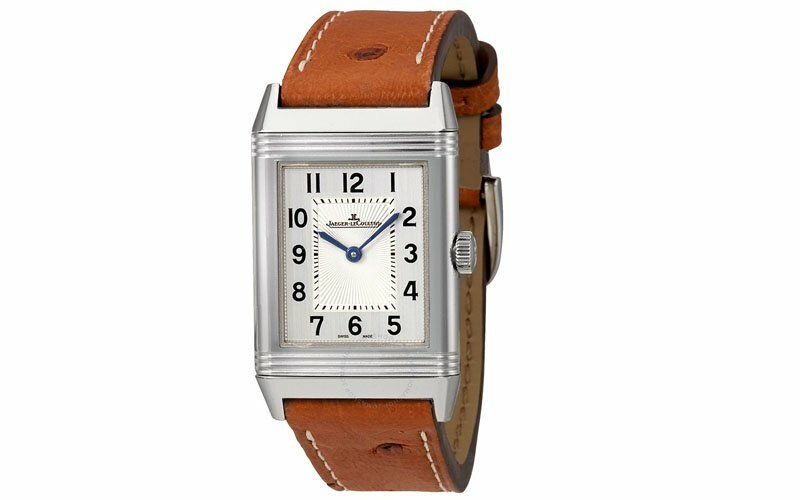 Jaeger LeCoultre’s quartz movement, Reverso Classic watch is made for all those men who want a little bit of luxury in their lives. 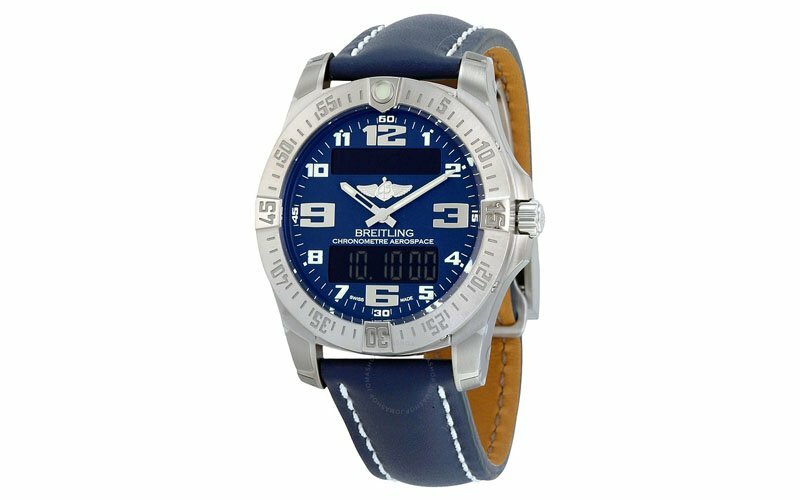 Its plain silver-tone stainless steel case pairs well with its brown leather strap while featuring a silver dial with blue hands and Arabic numeral hour markers. The Swiss-made watch’s rectangular case shape is 24.4mm by 40mm and has a scratch-resistant sapphire crystal glass. Though this watch isn’t just made for looks, it’s also water resistant up to 30 metres, meaning you won’t have to take it off when adventure calls. You’ll find it pairs nicely with a blue suit for evening occasions or a stylish smart-casual outfit during the day. 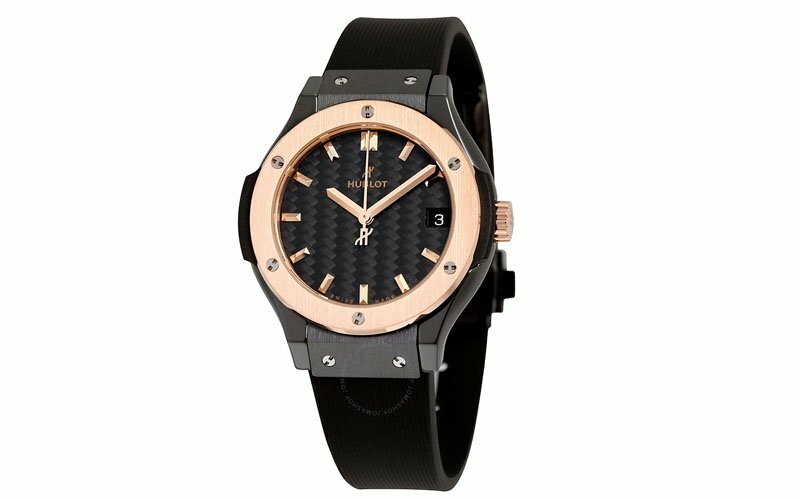 Hublot’s luxurious Classic Fusion Quartz movement watch has an expensive looking black ceramic case while featuring a downplayed black rubber strap. On top of that, it has a fixed rose gold-plated titanium bezel and black dial with rose rhodium-plated hands and index hour markers. Not to mention, it’s also water resistant at 50 metres and features a scratch-resistant sapphire crystal glass over the dial. The Swiss-made watch’s black and gold accents add to the overall lavish style of the watch, making it a great show-piece. You’ll look expensive wearing this stainless steel, quartz movement, luxury watch with a pale silver opaline dial and sword-shaped blue hands. 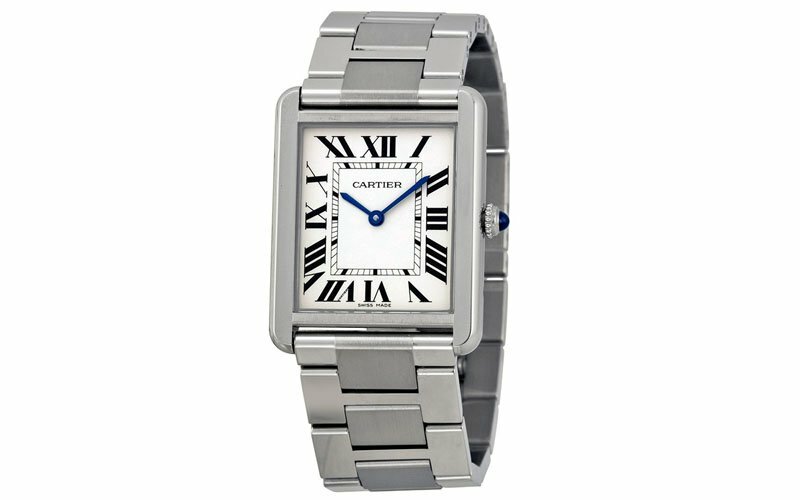 Cartier’s iconic designs stand the test of time with their Roman numerals that count each hour and rectangular shape. This design, in particular, has a case dimension of 34.8mm by 27.4mm and is also water resistant at 30 metres. Its impeccable scratch-resistant sapphire crystal glass and minute markers that surround the inner ring of the case also add a touch of style to the watch. If you’re on the market for a sophisticated and extravagant quartz movement sports watch, then look no further. The Frederique Constant Horological Men’s Quartz Smartwatch meets the 21 century with its built-in smart features such as sleep monitoring and activity tracking. 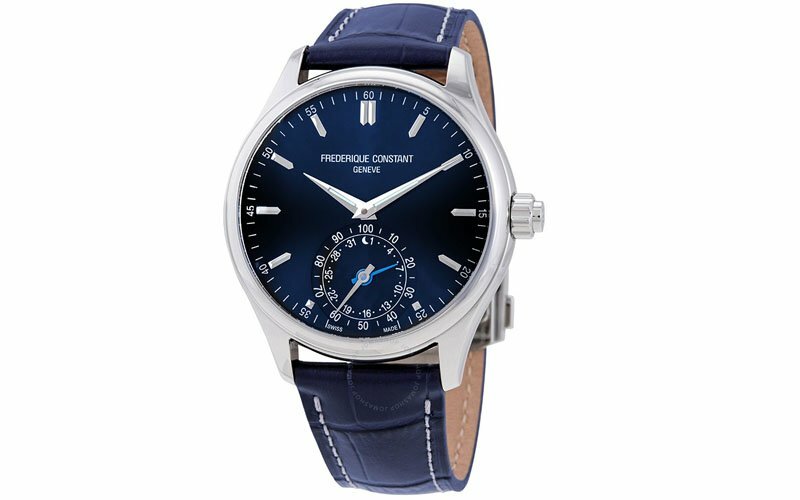 It’s silver-tone stainless steel case, bezel, scratch-resistant sapphire crystal glass and blue leather strap are very traditional. The watch also features a date display and a 1/100 of a second subdial, with the ability to be water resistant at 30 meters. This timepiece is the perfect alternative to a modern style smartwatch if you prefer a classic style. Edox’s wonderfully crafted silver-tone, stainless steel, quartz movement watch has a rounded case shape of 44mm. 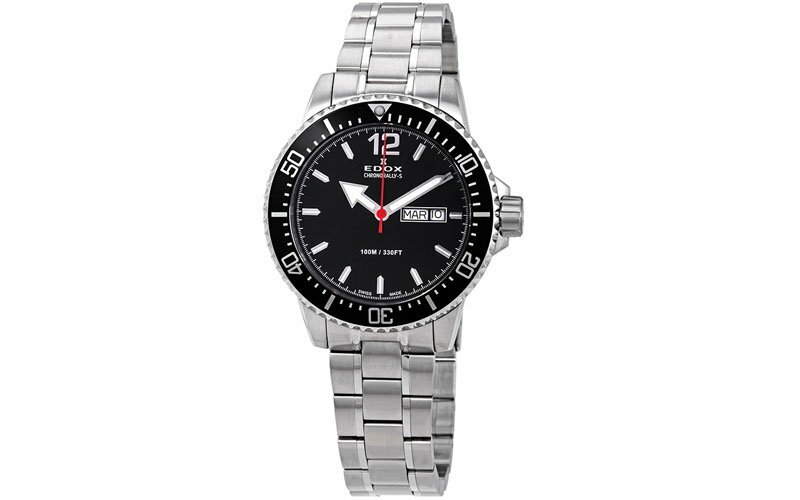 Its fixed black stainless steel bezel and black dial with luminescent silver-tone hands and markers make viewing your watch at night possible. While other impressive features include its antireflective, scratch-resistant sapphire crystal that enhances the dial and makes the watch easier to read. Perfect for summer activities and gents who like diving, this Chronorally-S design is also water resistant at 100 metres, making it a great timepiece for diving. 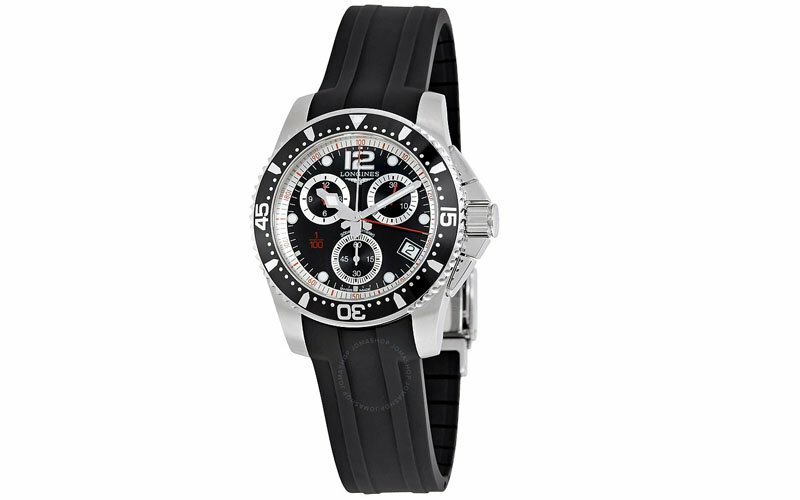 The Claude Bernard Classic Chronograph Quartz Watch features a silver-tone stainless steel case with a black leather strap. 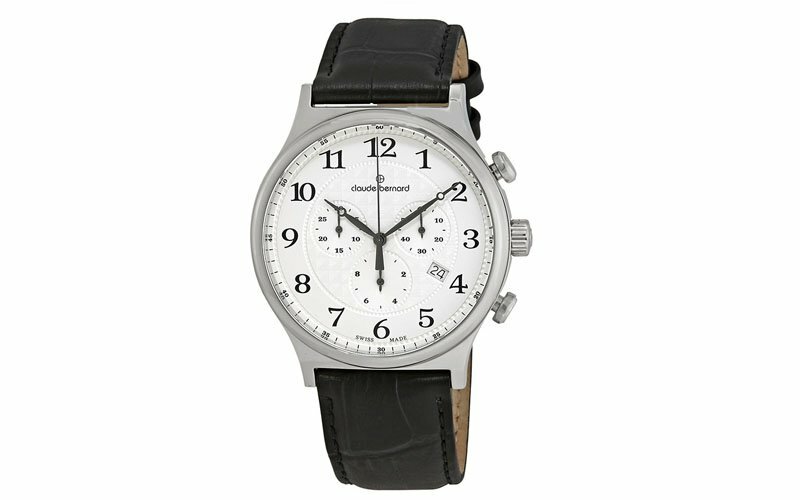 Its design includes a chronograph with three sub-dials, those being a 60 second, 30 minute and 1/10 of a second display. It also features a date display at the 4 o’clock position with scratch-resistant sapphire crystal glass. It’s rounded case shape measures 42mm and is safe to submerge in water up to 100 metres. This Swiss-made timepiece is a very traditional style, built with old-fashioned accents, such as the stopwatch features on the side. 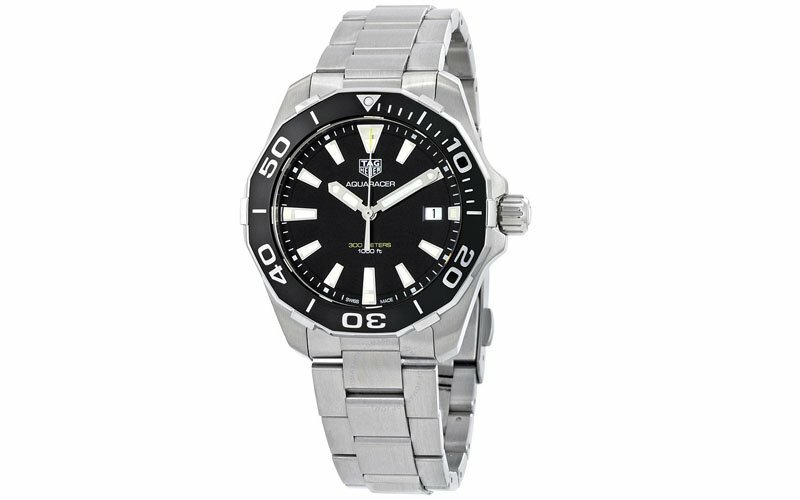 Tag Heuer Aquaracer Quartz Watch is the top of the line for any diver who tries to reach the ocean floor. This watch has super Aqua abilities such as being water resistant up to 300 metres and having the capability to withstand 93% humidity and 14 days of non-stop sweat. Impossible to crack under water pressure no matter what it’s put through, this watch has withstood 160 water-resistant tests. Of course, this design also features a screw down crown and solid screw-in case back with diving bell engravings and a deployment clasp. Made to attract those adventurous souls who are up for anything, this quartz movement design also includes a multi-directional rotating bezel with a black aluminium top ring. 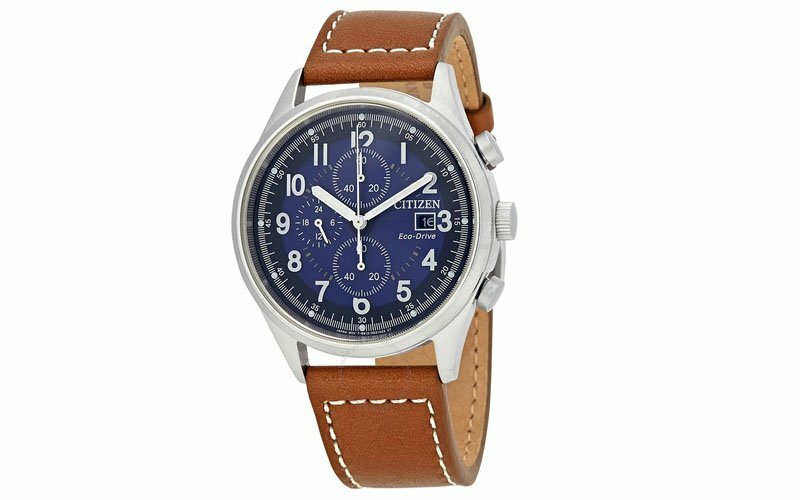 This Citizen Chandler men’s watch is great for day to day wear with its casual style, featuring a silver stainless steel case that measures 42mm and a brown leather strap. It has a chronograph, displaying three sub-dials including a 60 second, 60 minute and 12/24 hour face. Though the most innovative thing about this watch is its Eco-Drive B612 quartz movement. With the ability to generate power from any light source, such as artificial, natural or even dim lighting, this watch will never stop; forget about ever having to replace a battery again. Not to mention, it’s also water resistant up to 100 metres, making this watch the perfect choice if you often surround yourself with the earth’s elements. Talk about style. 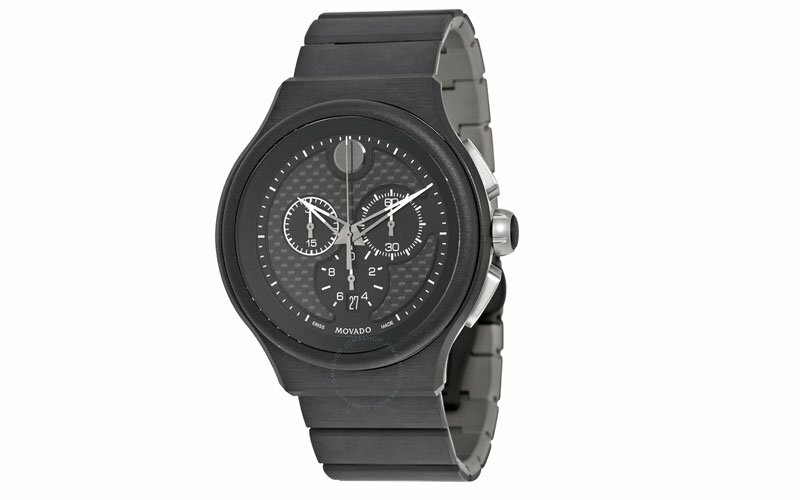 The Movado Parlee Men’s Quartz Watch is both smart and sophisticated, featuring a titanium and peek bracelet and case, with a black carbon fibre dial. Movado prides themselves on their dynamic designs that incorporate this unidirectional carbon fibre, which is an ultra-lightweight bike material that has been perfected by Parlee Cycles. The watch also features silver-tone hands and index hour markers, with scratch-resistant sapphire crystal that covers over the dial. Also featuring a chronograph, the face has three sub-dial displays, including a 60-second timer, 30 minute and one-tenth of a second. You’ll be thanking yourself for making this practical and stylish purchase. 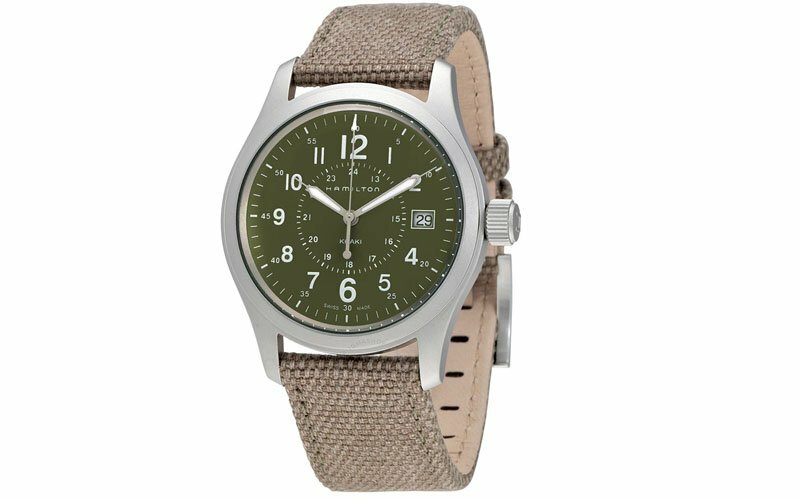 The khaki and olive colours make a bold statement about Hamilton’s strong military heritage. Featuring a nylon textured bracelet and silver-tone stainless steel case and bezel, this watch has a very distinctive style, though it’s equipped to suit a number of different looks, speaking volumes about the wearer. This Swiss-made, quartz movement timepiece features Arabic numeral hour markers around the face, as well as the minutes for an easy read. Tissot’s PRC 200 Quartz Watch is the perfect example of how superior a simple and casual watch can look with minimal features. 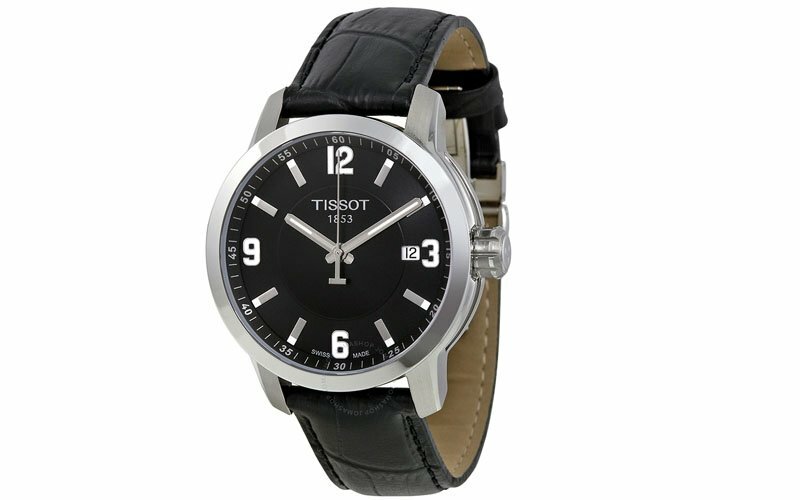 This Swiss-made, quartz movement design has a black leather strap and stainless steel case with a diameter of 39mm. While its black dial has luminous silver-tone hands and index hour markers, with Arabic numerals sitting at 3, 6, 9 and 12 o’clock that can be seen even at night. This watch is for men who like some serious watersports with a water resistance of up to 200m. 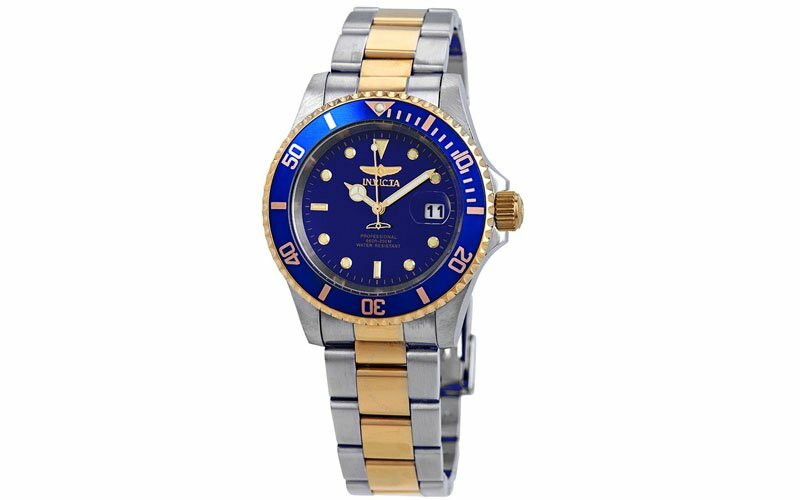 The Invicta Pro Diver Quartz Watch has a great price point if you’re looking for a reliable timepiece that you plan to get wet frequently. Water resistant up to 200 metres, the watch features a screw-in crown and case back for protection. While its uni-directional rotating aluminium bezel and scratch resistant flame fusion crystal glass only add to its level of performance. As for the inside of the watch, Invicta uses the Hattori Caliber PC32 quartz movement to maintain time. If you’re a man who wants a sports watch that has every possible feature, then this is the watch for you. 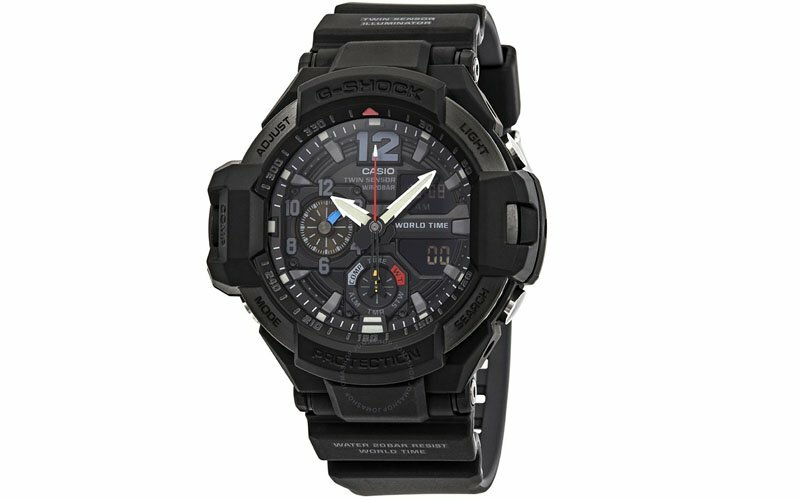 This Casio G-Shock Gravitymaster watch has a quartz movement of 5,441, is water resistant up to 200 metres and features hour, minute and second functions. But wait, there’s more, the design also includes a digital compass, thermometer and world time clock for those adventurous souls. It also includes a countdown timer and allows up to 5 daily alarms, while the watch also uses a 12/24 hour format, includes a calendar and has a hand shift feature, that being a 1/100-second stopwatch. This high-quality, Seiko Solar Quartz Watch features a black dial with luminous hands and has a case diameter of 40mm. Inside the dial, both Arabic numeral and GMT markings surround the face, with minute markers around the outer rim. With solar quartz movement, this timepiece takes all the energy it needs from light, never needing to change its battery. 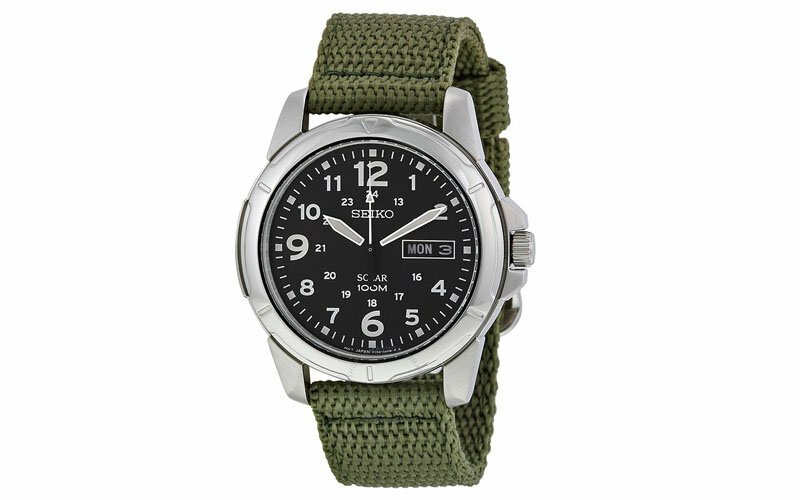 This field watch is built to withstand harsh conditions and is for men who seek thrilling outdoor adventures.